[ANNOUNCEMENT] FGD’s First Project: It’s Year of the G-Dragon: Welcome back Oori Kwon Leadah! Hi VIPs! In anticipation for BIG BANG’s Comeback, and their BIG SHOW 2012 this coming March 2-4, 2012, we already presented you with our Rice Wreath project. Link here: http://forever-gdragon.com/2012/01/05/announcement-fgds-first-project-its-year-of-the-g-dragon-welcome-back-oorin-kwon-leadah/. However, we want to further make this a special comeback for our one and only Kwon Leader. We know our leader had been in one of his toughest times last year, and as fans, we would like him to feel our support, especially from IVIPs. 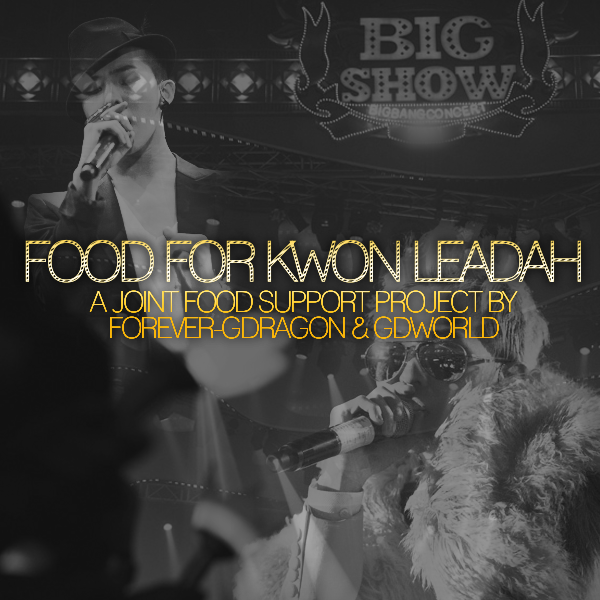 Our 2nd project is: Food for our Leader: Snacks to brighten up G-Dragon’s day ^_^. For the snacks, we will be collaborating with one of GD’s renowned Korean Fansites, GDWORLD. Together, we’ll be needing to pay for USD $1,500 for the snacks that we’d be giving out to GD, from production, to back stage, to artists. Snacks will be composed of Fruits, Drinks and Sandwiches. We will be accepting donations through Western Union. If you’re interested, please e-mail us at forever.kwonjiyong@yahoo.com or mention us @Forever_GDragon in twitter. Thank you for taking interest in this 2nd project of Forever G-Dragon site. I hope you will help us in making this project a reality, especially because we would be collaborating with GDWORLD, @GDWORLD_ and this will further assure you that GD will be able to accept our snacks for him. WELCOME TO THE WORLD OF G-DRAGON! Hello VIPs, especially GD stans! Welcome to our humble site fully dedicated to our one and only Kwon Leader, G the Dragon. Enjoy the site as you navigate through the different pages. 1. If you wish to re-post our posts, please always credit us properly. 2. No shipping. We are here solely for our Kwon Leader. 3. NO hotlinking of pictures. Please read our A/N after every post. 4. No spamming. Haters and trolls will be given your own taste of medicine once we caught you. I Be a Part of FGD Family!